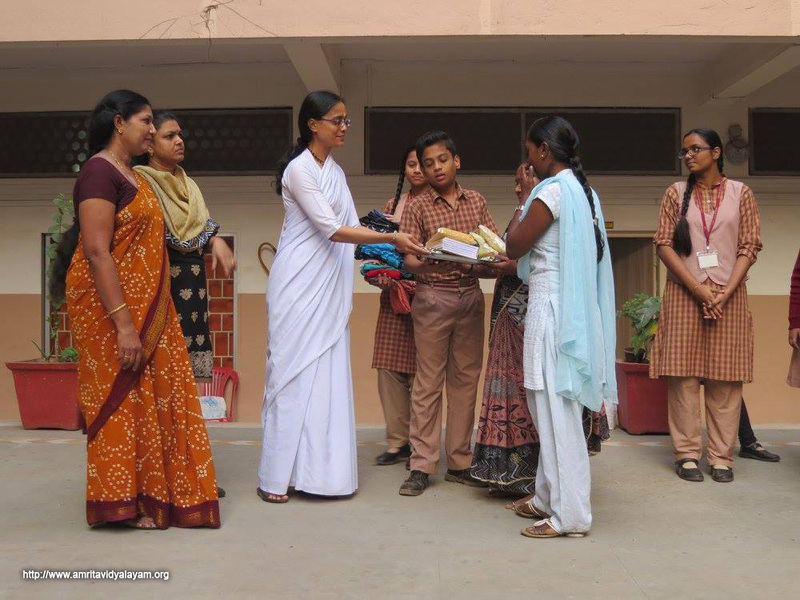 Sevamritham – Two of the adopted families were invited to school, and during morning assembly, each member was called to the stage to receive rice, dal, biscuits, toys, clothes, etc. One of our teachers also gave a cradle to one of the families who had recently been blessed with a baby girl. 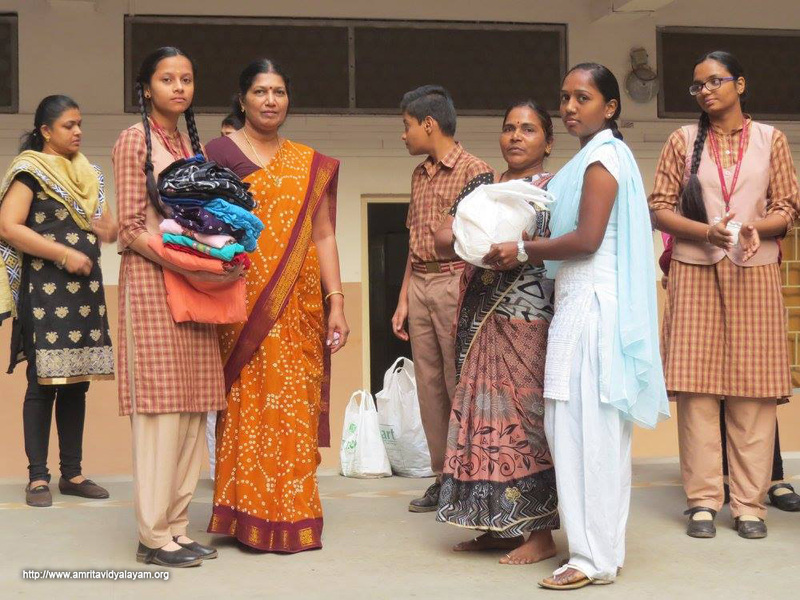 The students of 7 A collected books and stationery which will be given to families with school-going children. ‘Sealing of Desires’- Students are continuing to contribute towards the Sealing of Desires project generously. The money collected was utilized to provide necessary items to 3 families. 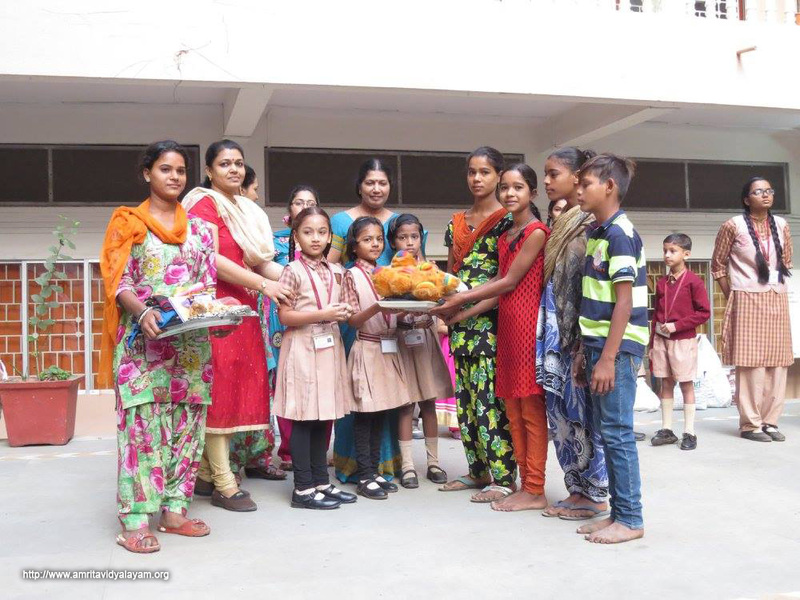 Bhootayajnam – Students from pre-primary to Standard II bring grains like rice, millet and jawar to feed birds on Monday. With rains becoming sporadic, the birds have also started coming in and happily feeding on the grains and drinking water from the earthen pots. 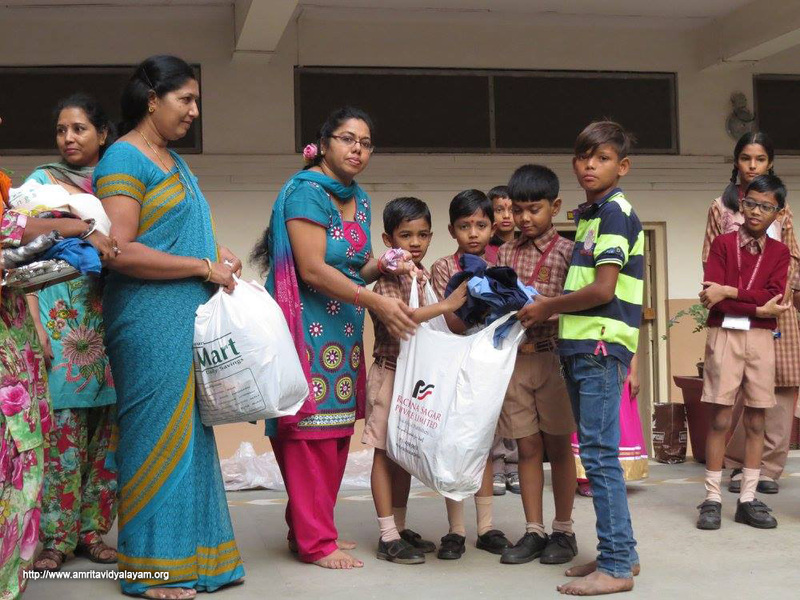 Snehamritham – Students are eager to celebrate their birthdays and even more eager to contribute towards the Sevamritham project by way of rice, clothes and toys. 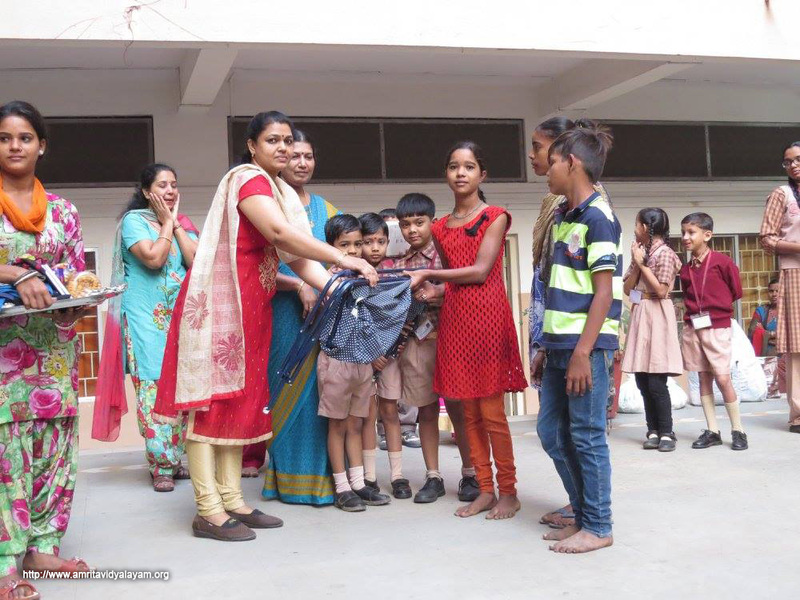 Amrita Katha – The values observed for the month were Hope, Character, Compassion and Teamwork. Students narrated stories about Swami Vivekananda and Amma. 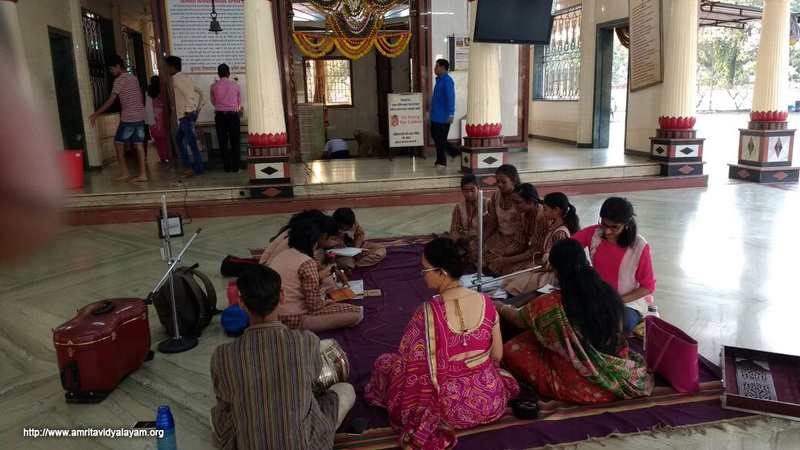 Temple Bhajans – On the auspicious occasion of Thai Pongal and Makar Sankranti, students visited the Datta Mandir in Sanpada on January 12, 2017. Students started the evening with Dhyayamo, paying their respects to “Amma” first. Thursday being regarded as “Guru’s” day, the students started with a bhajan in reverence to Digambara. They also sang bhajans of Lord Rama, Lord Krishna and Devi. The temple authorities had made adequate arrangements and the children also partook of the Maha Prasad. The soulful bhajans of the children will no doubt carry forward Amma’s dream of spreading cultural values to instil pride in the hearts and minds of the people. The evening ended with the rendition of Shanthi Mantra.